I'm new in load testing and I were happy when I found StressStimulus. It seem to be quick to learn and easy to use. However, when I tried to record and run a simple test (log in - log out a site), I failed. Could you please help me and tell what am I doing wrong? Recorded test shows that user's credentials were used and user were able to log in. After I ran the test I checked all sessions and saw that a user couldn't log in. i attached a few screenshots. I would really appreciate it if you could help me or let me know where I could find information how to start. It looks like your website uses form based authentication. If you were able to login during the recording, you should be able to login during the replay. To start troubleshooting, compare recorded and replayed sessions. To do so, click the “verify test case” button. StresStimulus will replay your test case once with one virtual user. If login will fail, StresStimulus most likely will display an error or warning in the grid, as shown below. Right-click on the error/warning and select “compare sessions”. The comparison tool used by Fiddler (windiff, by default) will highlight differences between the recorded and replayed login session. If there are any differences, check if they caused the problem. If there are no differences, then check your application to find out why the 2 identical login requests produced the different results. If verification will not detect the error, you still can compare these two sessions. 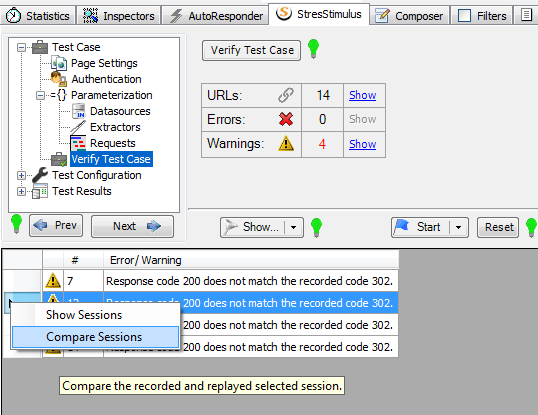 In the fiddler grid, right-click on the replayed session, then select StresStimulus Commands-> Compare with Matching Test Case Session.